This recipe’s the answer to your prayers; it’s fast, simple, and completely fat-free. I love this for a perfect post-workout snack! Preheat oven to 375 degrees, and prepare a muffin tin by spraying it with Pam. Combine applesauce, egg whites, pumpkin, banana, and vanilla extract in a bowl, mix well with a blender. Combine the dry ingredients in a separate bowl gently (don’t crush the blueberries!). Once both mixtures are thoroughly combined, add the dry ingredients to the wet gradually. Once incorporated, pour batter into the prepared muffin tin. Bake for 17-20 minutes at 375 degrees (or until toothpick comes out clean). Recipe makes 12 high protein, fat-free muffins. 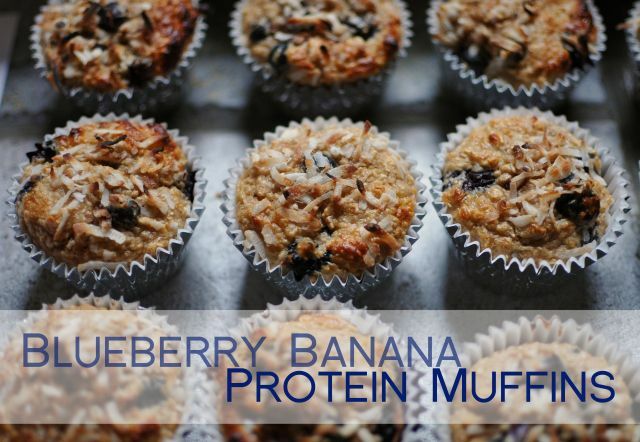 This entry was posted in Recipes and tagged blueberry muffins, fat free recipe, guilt-free, protein recipe, Recipes. This looks great! Any chance you can publish the nutritional info? I follow a strict diet as far as ratio of protein/carbs/fats is concerned and want to know how I can fit these into my diet. Olesya, Have you ever worked with NuNaturals Stevia Baking Blend? It works great and is a great sub for the fake stuff. They sent me a lifetime supply (not really but a lot) of their products to review for my blog and I am in love with all of them. Recipe looks great 🙂 Thanks! Justine, What would be the measurement of Stevia used if you were to use it in this recipe? Wow, Justine; I actually haven’t — but it sounds great! I’ll check it out for sure! 😀 Thank you! I would also like to know what is the measurement if I use Stevia because I really don’t like Splenda. Or would Agave syrup do? It really depends on the Stevia you’re using — there are so many different brands, and each one seems to have a different standard. Each manufacturer will usually have a guide explaining how much of their product will equal different amounts of table sugar. A cup of Splenda is the same as a cup of table sugar, so you can just go by the manufacturer’s directions for conversion instructions. Thanks! I will give it a try this weekend! I made these yesterday – delicious! I used Beverly International protein powder and toasted oat bran from Trader Joe’s. There were a couple that got stuck in the pan because the blueberries were on the side, but most of them popped right out and were picture-perfect. Great banana taste, too. Thanks for this, Olesya! Thanks for the recipe O, I did a chocolate banana variation on your recipe and it was delish I will be making these next carb up day also. These were really amazing – the consistency was so rich and thick that I was surprised! Thanks!! I actually made a batch and took it to my gym and the guys loved it. I added .25 cup more applesauce, .5 cup more Splenda, and 3 tsp baking powder. Next time I will try baking soda instead. Even though I sprayed Pam liberally, a couple still crumpled while I tried to take them out. I will try baking cups next time!